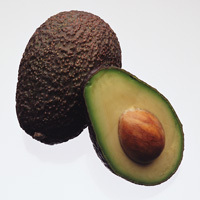 Occurrence: Avocado is consumed as a fresh fruit and in sauces such as guacamole. Avocado allergy can take two different forms: one associated with allergy to tree pollen, such as birch, and another type associated with latex allergy. People with birch-pollen allergy can develop symptoms either immediately or up to 1 hour after eating fresh avocado or an avocado-containing food. Symptoms comprise local reactions in the mouth and throat with itching and inflammation (called oral allergy syndrome, OAS). Others develop an avocado allergy because of the similarity between the allergens in avocado and natural rubber latex (e.g. gloves, condoms, balloons) a condition known as the latex-fruit syndrome. Symptoms developed by these individuals comprise generalised urticaria, abdominal pain, vomiting and sometimes life-threatening symptoms. These individuals may also develop adverse reactions to chestnut, banana, mango and kiwi. Systemic anaphylaxis in 7 patients with angioedema/urticaria in 6, vomiting in 2, bronchial asthma in 1, and rhinoconjuntivitis in 1 (Blanco et al. 1994) . Urticaria and lip pruritus or glossitis in 25 patients. Rhinitis in 3 patients , facial angioedema in 2 patients and anaphylaxis in 2 patients (Blanco et al. 1994) . The prevalence of clinical reactions to avocado among 17 latex-allergic patients was: 72% with asymptomatic sensitivity; 16% with anaphylaxis ; 2% with pruritus and 4% with generalized urticaria (Blanco et al. 1999) . The clinical data for 16 avocado-allergic patientes was: 6 patients had systemic anaphylactic episodes; 2 with urticaria; 4 with angioedema; 3 with bronchial asthma and 4 with oral allergy syndrome (Chen et al. 1998) . Dilution 1/10 of a commercially available avocado extract (Beezhold et al 1996) . Histamine and the diluent were used as positive and negative controls respectively (Beezhold et al 1996) . 7/11 patients had a positive SPT to avocado (Ahlroth 1995). The allergen extracts were separated by sodium dodecylsulfate–polyacrylamide gel electrophoresis (SDS-PAGE) with a 5% stacking gel and a 13% polyacrylamide gel (Moller et al. 1998). The proteins were transferred onto a nitrocellulose sheet. The nitrocellulose sheet was blocked with 3% (w/v) skimmed milk and incubated with patient sera (1:100). IgE antibody detection was performed with alkaline phosphatase-conjugated goat anti-human IgE (1:100) and blots were developed with AP Conjugate Substrate (Lavaud et al 1995) . The proteins were transferred onto a nitrocellulose membrane (0.2 µm) using a semi-dry blotting apparatus. Membranes were cut and blocked with 5% (w/v) skimmed milk and 0.1% (v/v) Tween 20 in PBS. The strips were incubated with patient sera. After incubation with rabbit anti-human IgE (1:4000), biotinylated goat anti-rabbit IgG (1:6000) and streptavidin-horseradish peroxidase-conjugated (1:20000), the blots were stained with 3,3",5,5"-tetramethylbenzidine-dioctylsodiumsulphosuccinate (Moller et al. 1998). All patients' sera from group 2 (fruit and latex allergy) reacted to avocado proteins. The most important allergen in the extract was at about 30 kDa. A minor band was found at 21 kDa in one serum. Two sera from group 1 (monoallergy to latex) reacted with the 30 kDa protein (Lavaud et al 1995) . IgE binding components of 43, 52, 58 and 65 kDa were detected by 3, 5, 7 and 5 serea respectively. One serum showed IgE binding to a protein of 27 kDa (Moller et al. 1998). Number of Patients:2 latex-allergic subjects with positive SPT and CAP responses to avocado and latex. Cross-reactivity among latex, avocado, and banana (Blanco et al. 1994) , (Blanco et al. 1999), (Lavaud et al 1995) , (Delbourg et al. 1996) (Chen et al. 1998), (Brehler et al. 1997), has been demonstrated by RAST-inhibition or immunoblot inhibition (Moller et al. 1998). Isola S, Ricciardi L, Saitta S, Fedele R, Mazzeo L, Fogliani O, Gangemi S, Purello-D'Ambrosio F.
Latex allergy and fruit cross-reaction in subjects who are nonatopic. "Latex-fruit syndrome": frequency of cross-reacting IgE antibodies. Beezhold D.H., Sussman G. L., Liss G.M. and Chang N.S. Latex allergy can induce clinical reactions to specific foods. Ahlroth M, Alenius H, Turjanmaa K, Makinen-Kiljunen S, Reunala T, Palosuo T.
Cross-reacting allergens in natural rubber latex and avocado. Blanco C., Diaz-Perales A., Collada C., Sánchez-Monge R., Aragoncillo C., Castillo R., Ortega O., Alvarez M., Carrillo T. and Salcedo G.
Class I chitinases as potential panallergens involved in the latex-fruit syndrome. Blanco C., Carrillo T., Castillo R., Quiralte J. and Cuevas M.
Posch A., Wheeler C.H., Chen Z., Flagge A., Dunn M.J., Papenfuss F., Raulf -Heimsoth M. and Bauer X. Class I endochitinase containing a hevein domain is the causative allergen in latex-associated avocado allergy. Chen Z., Posch A., Cremer R., Raulf-Heimsoth M. and Baur X. Identification of hevein (Hev b 6.02) in Hevea latex as a major cross-reacting allergen with avocado fruit in patients with latex allergy. Determination and characterization of cross-reacting allergens in latex, avocado, banana, and kiwi fruit. Identification and cloning of Prs a 1 a 32-kDa endochitinase and major allergen of avocado, and Its expression in the yeast Pichia pastoris. Allergen properties & biological function:Prs a 1 is an endochitinase with a possible defence function against plant pathogens and belongs to pathogenesis-related protein family PR3. Avocado pulp is ground in cold acetone and then defatted with 3x 1:5 (w/v) of the same solvent for 1h at 4C. After allowing solvent to evaporate the dried residue is extracted with 5 volumes of 0.1M sodium phosphate buffer, pH 7.0 containing 0.15M NaCl (PBS) for 1h at 4C. After centrifugation the chitinase is precipitated from the supernatant with 80% ammonium sulphate. Following centrifugation the pellet was dissolved in PBS and acidified to pH 3.5 with 0.1M HCl. After another centrifugation step the supernatant was retained, dialysed against water and freeze-dried. The chitinases were then purified by affinity chromatography in on a column of regenerated chitin in 20mM Tris-HCl pH 8.0 and eluted using a step-wise gradients of 20mM sodium acetate pH 5.5, followed by 20mM acetic acid pH 3.2. Chitinase containing fractions were collected and then subjected to a final purification step on a cation exchange column (MonoS) equilibrated in 10mM sodium acetate (pH 5.3) and eluted with a salt gradient to 0.5M NaCl. (Diaz-Perales et al 1998) . Prs a 1 has also been expressed in the yeast Pichia pastoris and purified by cation exchange chromatography (Sowka et al. 1998) . Prs a 1 has a calculated pI of 8.43 (Sowka et al. 1998) . Class I chitinases with hevein-like domain, but not class II enzymes, are relevant chestnut and avocado allergens.